If you have never heard the term 'flying monkeys' in regards to narcissism, the picture above explains the premise fairly well. Although I am strong-willed with positive intentions, I do know what it is like to become a flying monkey and to not even know it is happening. The hardest part of it is suffering the guilt of your actions later when you reflect on things with a clear head. And a clear head is not something you will have while under the control of a Narc. You are likely doing things that go against your own ethical grain and things that are causing you guilt and remorse, but the narc will continue to push you in this way, because they have no idea how to self-reflect and have no remorse for their negative actions. On the other hand, they will use your natural ability to self reflect and your feelings of remorse against you to keep you off balance, and out of control. As long as you are out of control, they get to maintain it. When you begin to truly discover this they will 'love bomb' you even more to keep you on the 'roller coaster ride'. I never did anything that caused me great guilt during my stay in my last not-for-profit organization, but I did follow rules made by the narc that went against my own personal ethics and values. The narc will have you convinced that everything they do is for the greater good, and let me tell you, they are extremely good at this. What you eventually learn once the fog lifts from the brain is that everything they do is to serve their own agenda, and to feed their narcissistic supply! And they will do anything, and I mean anything, to maintain their image and the illusion of them being a good and caring person. The hardest part for me is watching other good empathic people becoming flying monkeys. They have become so exhausted from fighting the battle with the narc behind closed doors, that eventually their inner strength disappears. 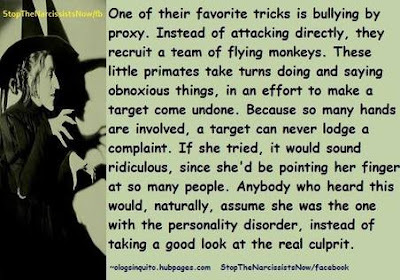 It is like treading water for a very long period of time, and once you can no longer keep your head up, the narc has complete control and becomes the 'puppeteer' of the flying monkeys. The self worth of the monkeys becomes so low that they believe they can't succeed without the narc, and therefore stay in the abusive situation hoping that things will eventually improve. IT WON'T!!!!!! The longer a kind and compassionate person remains a flying monkey, the more difficult it is to stop. The abuse and control is by design of the narcissist. She now has almost complete control and your only way out is to leave. When the flying monkeys eventually realize how they have treated other kind compassionate people in their lives during their venture with the narc, they often will feel immense pangs of guilt. The nice thing for the flying monkeys in this regard is that they get to learn who is truly there for them when they need it, and who is only keeping them around for their own purpose. I don't hold anything against the flying monkeys in my example because I have been where they are now, and know the anguish and suffering they are living through, but it still hurts to watch them have to go through it. There is little I can do but expose the problem for now, so I will continue to do this over the next few weeks while finishing up my book. I do know that I am so much stronger willed than ever before in my life due to my own suffering, and I would still be there for the flying monkeys in an instant if they ever need my help. As Jesus said, "Forgive them Father for they know not what they do!" I will also share more details of my own story during my explanations of different aspects of NPD. I walked away from my own abusive situation, and although it was one of the hardest things I have ever done, thank God I did so, or I would not be sitting here sharing my experience with you right now. I know what the bottom of the pit feels like and I was there, and the end was not far away. Once I solved my own inner conflicts due to the abuse, I was able to continue reflecting until I found myself once again. I have always been somewhat fearless and I had to fight my anxiety for a couple of decades to stay this way. I began building up my inner strength after I healed mentally and my courage is building along with it. I plan to expose my whole story in regards to narcissistic abuse along with all of my intense research over the past couple of years, in the hopes that it will help others in their situations. This is a growing problem in the world, and it is growing at a very rapid rate due to social media. We have all likely had horrible experiences at some point in our lives with a narcissist or sociopath. I certainly have never wanted sympathy from anyone and I don't believe my situation is any worse than yours. I just know that my situation was horrible and felt like working in a prison camp for a long period of time, and although I was content walking away so I could heal, I can no longer turn a blind eye to the problem when there are good human beings suffering what I suffered. I hope you will follow my story and find some solace in some of the words. You are not alone in your suffering, but most abused people stay quiet about what is happening so you will often feel like you are alone. I am at a point where I am simply tired of the abuse happening to good people and feel the need to do something about it. My hope is that I can show others that there is a light at the end of the tunnel and that you have been put through this piece of life's journey for a reason. You will come out stronger on the other side and ready to fight these evil humans as well, and from a platform of experience and wisdom. First you must reflect and find out if you are a 'flying monkey' at the moment. Look up the term, there is tons of good information about this on the internet. I did not think I was one either at the time! "The best defense is a good offense" Learn all you can about your abuser! Don't try to expose them at this point or let them pull you in with their toxic words. Be yourself and love yourself! The more you love yourself, the more you will see how you are being abused.